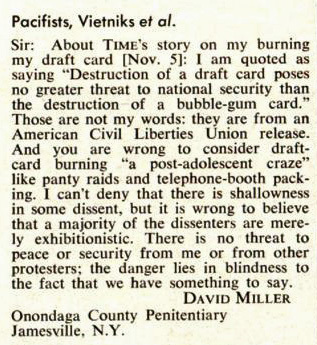 David Miller was not the first person to burn his draft card in protest of US involvement in the Vietnam War, but his case became the most publicized. As more and more people protested the war, various ways of demonstrating that protest began. When burning a draft card was first being done, it was not illegal to do so. 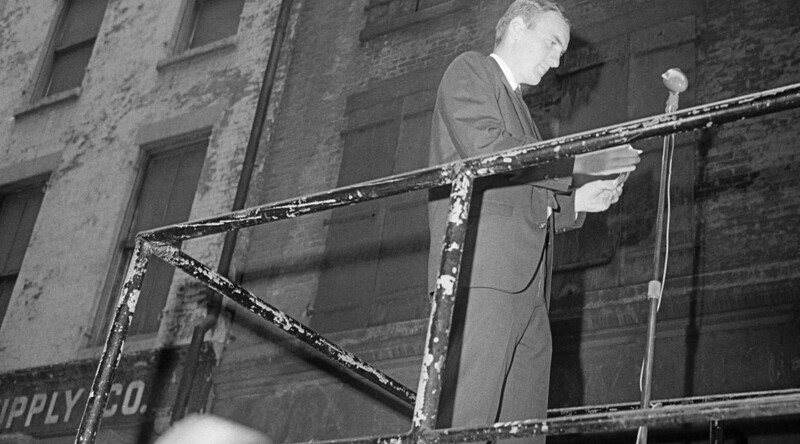 On May 12, 1964 twelve student publicly burned their draft cards in New York City. 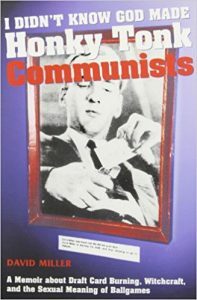 On May 5, 1965, forty men burned their draft cards at the University of California, Berkeley and a coffin was marched to the Berkeley Draft Board. Draft-card burners in 1965 at the Union Square Pavilion, from left, Tom Cornell, Marc Edelman, Roy Lisker, David McReynolds and Jim Wilson. Dutch-born clergyman and activist A.J. Muste is at right in hat and topcoat. On December 21, the four were indicted. On February 10, 1966 a jury convicted David Miller of burning his draft card, A judge sentenced him to three years in prison. 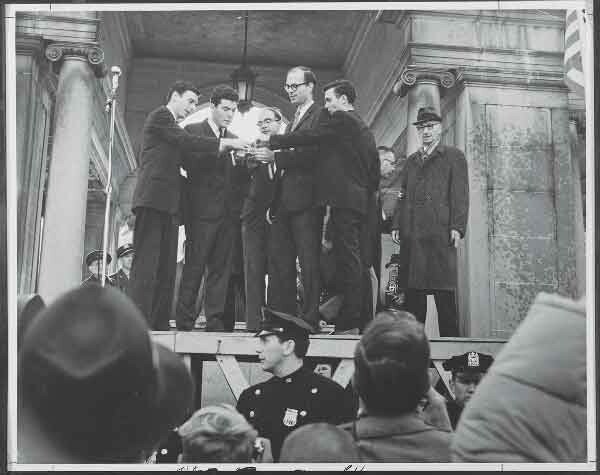 As an example of how divisive the war in general and draft card burning became, on March 31, 1966, high school boys punched and kicked seven anti-Vietnam demonstrators on the steps of the South Boston District Court House after four of the protesters had burned their Selective Service cards. With shouts of “Kill them, shoot them,” about 50 to75 high school boys charged the steps and knocked the demonstrators to the ground as a crowd of 200 watched. David O’Brien, 19, was one of the card burners. On July 1, O’Brien was sentenced to a Federal Youth Correctional Center for an indefinite term. On October 13, 1966, the US Court of Appeals for the Second Circuit upheld Miller’s conviction. It held that Congress had the right to enact a law against destroying a draft card so long as it did not infringe on a constitutional right. 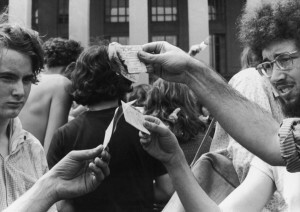 The NY Civil Liberties Union challenged the constitutionality of law prohibiting draft card burning on December 12, 1966. The appeal charged that the law was an unconstitutional abridgment of the freedom of expression guaranteed by the First Amendment and its purpose is to suppress dissent. 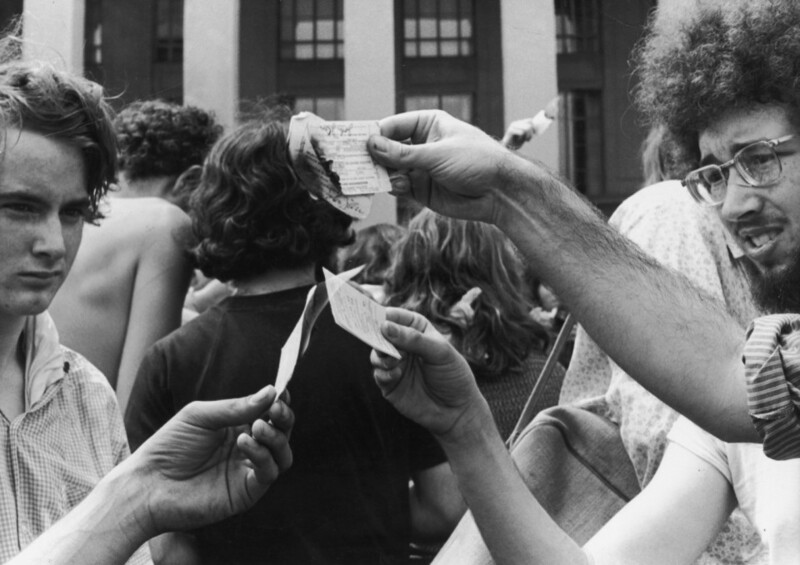 The US Court of Appeals for the First Circuit held unconstitutional the amendment to the Selective Service Act that forbade the burning of draft cards on April 10, 1967. Miller later wrote I Didn’t Know God Made Honky-Tonk Communists. Here is a link to an excerpt from the Reclaiming Quarterly site. was just wondering if you knew whether this David Miller is the same as the author of 90mph door?